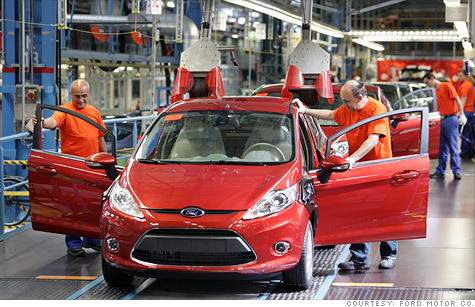 A Ford assembly line in Germany. European losss are the biggest problem facing U.S. automakers. NEW YORK (CNNMoney) -- Europe's economic weakness will hit home for U.S. automakers as they report quarterly results in the next few weeks. Ford Motor (F, Fortune 500), which is scheduled to report July 25, warned last month that second-quarter results would be hurt by larger losses in its European unit. The company said the conditions in Europe have "deteriorated significantly" since guidance given at the start of the year, and that the problem would continue for the "foreseeable future." Chief Financial Officer Bob Shanks told The New York Times that the company couldn't rule out closing one of its five European plants. Last week, General Motors (GM, Fortune 500) announced a management change in its European operations, putting vice chairman Steve Girsky in charge in an effort to stem losses. On Wednesday, it replaced the chief financial officer and head engineer of its Opel unit, GM's primary European brand. GM has not given any new guidance about European losses, with CEO Dan Akerson calling them a "work in progress" in a May earnings call. But analysts expect losses to continue through at least the rest of the year. GM's results are slated for release Aug. 2. The ongoing sovereign debt worries and austerity plans that have thrown much of Europe into a recession are taking a huge bite out of auto sales just as they're rebounding in the United States. U.S. auto sales soared 15% year-over-year in the first half of 2012, according to sales tracker Autodata. But sales in Western Europe fell 4.2%, according to figures from LMC Automotive. European auto sales have fallen steadily since 2008. Even before that slide started, U.S. automakers had a tough time making a buck in Europe. Labor laws in much of Europe make it expensive and difficult to close unprofitable plants, resulting in significant excess capacity there. GM says it has lost $14 billion in Europe over the last 12 years. "It's been a problem for a long time, and I don't see an easy way out," said Gary Silberg, national automotive industry leader for accounting firm KPMG. He said automakers want to close unprofitable European plants, but that "I don't think there's political will to allow it to happen." U.S. auto plants are operating at unprecedented levels, in many cases adding a third shift for the first time in their history. Ford's North American plants are operating at 93% of capacity, while GM was 103% in North America in the most recent quarter, according to the companies. But GM and Ford's European plants are operating at about two-thirds of capacity, according to estimates from Morgan Stanley. "Ford knows it cannot let its European excess capacity fester, something has to be done," said Morgan Stanley analyst Adam Jonas. Related: Five funky cars you can't get in the U.S. Strength at home has put U.S. automakers and suppliers in better position to weather Europe's storms than they might have been before. But worries about the losses in Europe remain a drag on the earnings outlook and share prices. Since the Ford warning on June 28, analysts have been cutting estimates for earnings at both Ford and GM, not only for the second quarter but the remaining periods this year and even into 2013 in some cases. Ford is now forecast to earn 28 cents a share in the second quarter, down from 35 cents before the warning, and the 65 cents a share it earned a year earlier. Analysts have cut GM's earnings estimate to 78 cents a share from 86 cents, and the $1.54 it earned in the prior year.